Rising profitability has investors feeling more optimistic about this business. 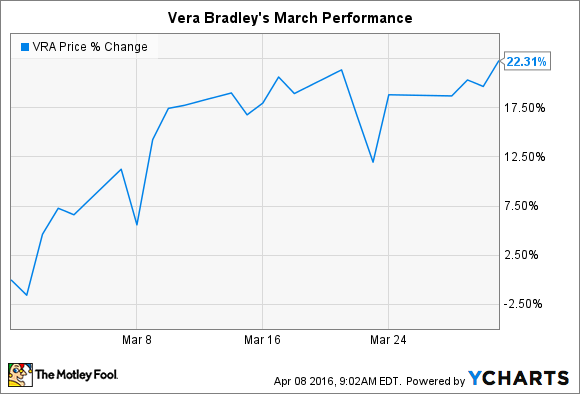 What: Women's apparel specialist Vera Bradley (NASDAQ:VRA) jumped 22% in March, according to data provided by S&P Global Market Intelligence. Shares are now up by double-digits over the last year, and by a whopping 35% in just the last six months. So what: March's stock surge was powered by fourth-quarter results that showed strong profit growth on a declining revenue base. Comparable store sales fell 5% as Vera reduced its promotional price cuts, with the trade-off being a sharp profitability boost: Gross profit margin jumped to 58% of sales from 52% in the prior-year period. "We took a very disciplined approach to enhancing gross profit in fiscal 2016, and we are especially proud of our 370 basis point gross profit percentage increase for the year," CEO Robert Wallstrom said in a press release. Now what: For the fiscal year ahead, Vera Bradley investors can expect to see a brand relaunch, supported by new marketing and fresh additions to its jewelry, fragrance, and handbag lineups. The strategy has many on Wall Street feeling bullish about the retailer's prospects even though sales growth hasn't shown up yet. In addition to the brand transformation and revenue rebound, Wallstrom and his team have their gaze set on exploring new long-term revenue streams like licensing and international markets. While cautioning investors that "it may take more time and effort to return the business to solid growth," Vera Bradley predicted sales will improve in 2016 for the first time in three years even as profitability continues to rise. That forecast seems reasonable and could power sustained growth in the stock.